Welcome to our gallery of gorgeous white bedroom ideas. These bedrooms showcase pictures in from different design styles such as traditional, contemporary, modern, minimal, transitional and eclectic. From beautiful master bedrooms to cozy attic rooms, you’ll find plenty of ways to incorporate white to create your ultimate bedroom retreat. Using an all-white colors scheme sometimes give a rather bland feel to a space, but adding the right amount of textures, patterns and combination of undertones creates pleasing results. The large bedroom pictured above uses off-white carpet floor with white marbled walls and moldings. The white pattern on the off-white fabric used on the upholstery adds a subtle texture, while the warm white light on the cove ceiling and the light cream curtains adds a touch of warm tones to he space complementing the wooden pieces. This bedroom is Rococo-inspired, using classic furniture pieces with feminine and curved silhouettes, making it look a little more toned down with the use of white and cream for the color scheme. Instead of pink or other pastels for the wallpaper, it favors the use of white and gray damask wallpaper for a more modern feel. Furniture pieces are in a combination of finishes as well. The bay window seat uses white-painted wooden base with matching white upholstery and pillows, the sitting area uses Mahogany wood pieces with white upholstery, the four-poster bed is made from fruitwood with white headboard and sheets, the side tables are white as well, the bench uses silvered wood framing with silver fabric, and the accessories are in gold. The subtle contrast of the white fabrics with the gold and wood finishes is pleasing to the eye and creates a very balanced look. This transitional style bedroom can be seen combining different styles and motifs for its architectural details. You will see Islamic arches with classical order columns, as well as French lattice-inspired ceiling design. Despite the variety of design styles, as all of those were finished in white, they look more cohesive and well put-together. Furniture pieces on the other hand are all classic-inspired modern pieces, such as the tufted bed with off-white upholstery, matching the fabric used on the sofa. It also uses metal and glass furniture like the round side tables and coffee table. Because this bedroom is quite spacious, it is also able to ‘frame’ different areas through the use of jute area rugs, helping you visually delineate the bedroom area from the reading and lounge area. A modern Asian-inspired bedroom which uses warm-toned whites to achieve this look. Creamy white carpet is combined with cream-colored wallpaper with silvery white damask patterns, creating a subtly warm background for the space. The four-poster modern bed platform stands out as its wood is stained in very dark wengue color, matching the finish used on the armchairs and the side tables. 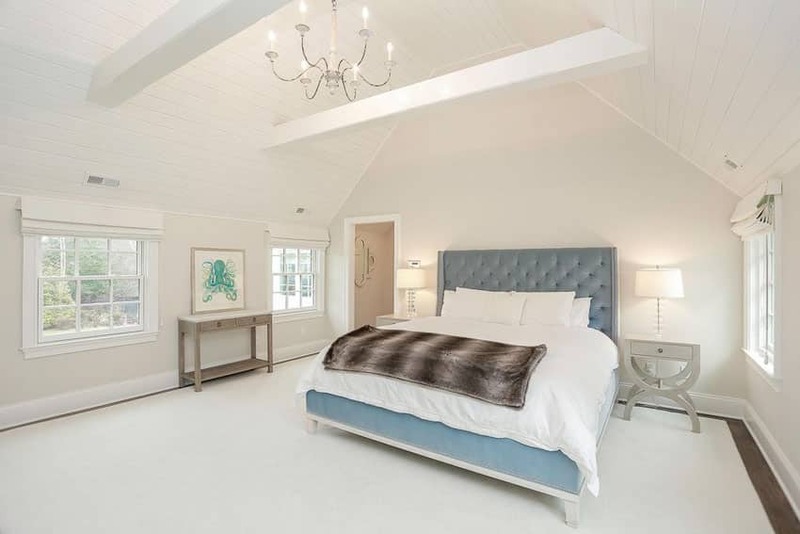 On top of the bed platform is a fully-upholstered white bed which uses brown quilted sheets and pillowcases, adding a touch of texture and a warm accent color to the space. 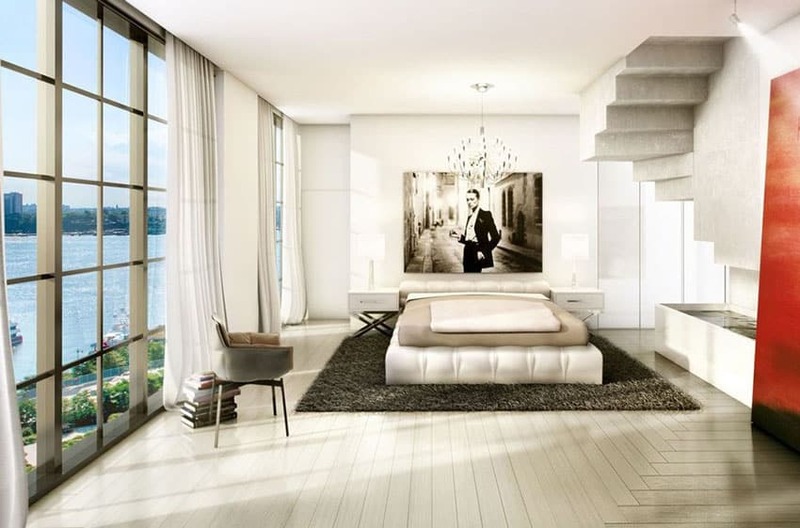 A gorgeous modern bedroom space which looks even more stunning because of its panoramic city view. 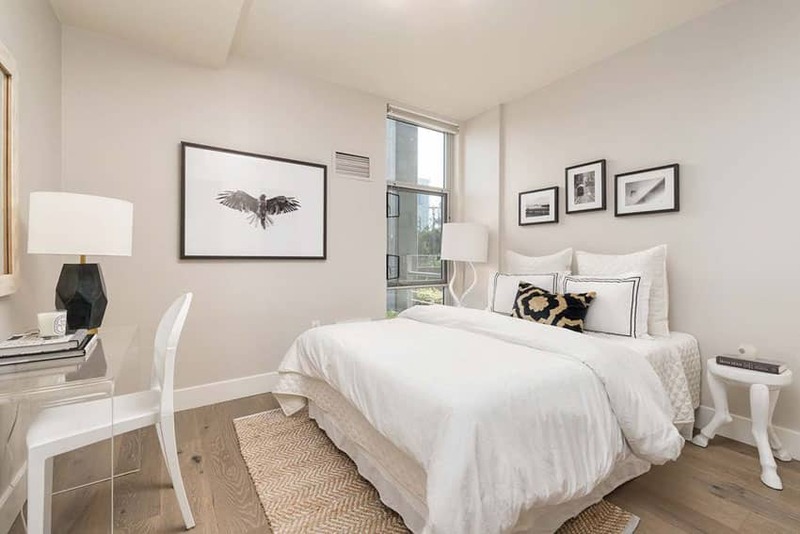 The interiors looks clean and simple; off-white walls, all-white furniture with a combination of pure whites and off-whites, and a large shaggy off-white rug to frame the bed area and making it stand out from the wengue wood flooring. Going for a more dainty look, this classic bedroom combines white with light beige to create a soft and light color scheme with timeless elegance and charm. Paneled walls are painted in a light cream color and pairs it with white carpet floors and white moldings. These are combined with light beige floor to ceiling-padded headboard, and light beige velvet upholstery for the furniture pieces. A large light beige area rug was also placed at the bottom edge of the bed to frame the area and give it more emphasis, as well as help make the light cream sofa stand out. Keeping things simple is one of the best solutions for small spaces such as this. You can see that the walls and ceiling were kept plain, painted in an off-white color which perfectly complements the rustic walnut wood flooring of the room. The bed is also very simple with no headboard or foot board, and uses white sheets and quilts for cover. The small black pillow acts as the accent for the bedroom, while the black photo frames adds a bit more personality to the space. This bedroom looks very relaxing and cozy with its combinations of taupes and whites. Light taupe carpet floors complements the cooler toned light gray paint on the walls, and helps balance the look. The accent wall behind the headboard uses a combination of metallic white wallpaper and full-size mirrors, adding shine and an illusion of a bigger space. Furniture pieces uses matching fabric upholstery in taupe to add a warm tone to the space, helping it look more cozy and relaxing. A modern take on classic elements makes this all-white bedroom unique. Teak wood floors set a warm ambiance to the space, while the all-white color scheme with silver accents makes the space look unique and dainty. 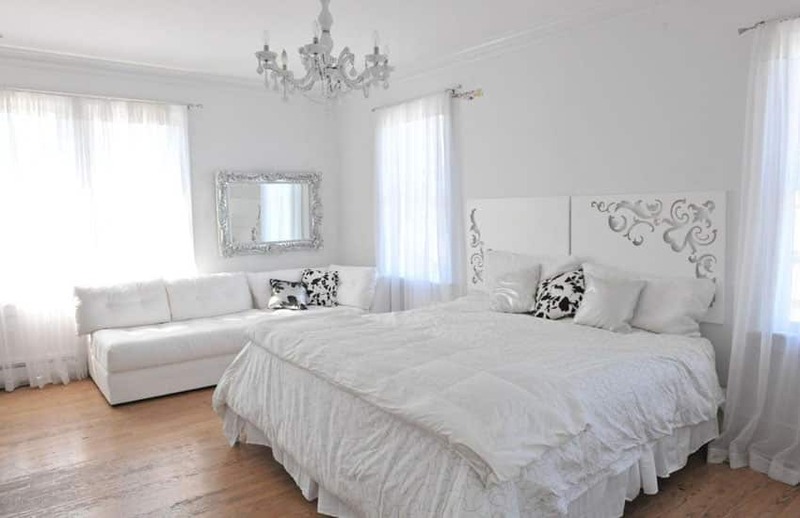 The bed is very simple with classic style bed covers and a unique pierced headboard painted in white. On the side you will see a white lounge with a silvered mirror hanging behind it, adding a classic touch to the surface. 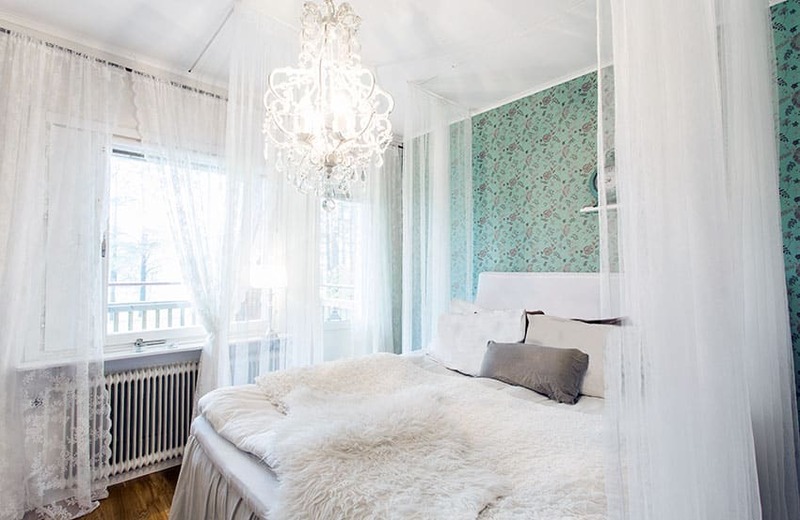 The bedroom also uses sheer white curtains and classic-inspired mini chandelier to complete the look. 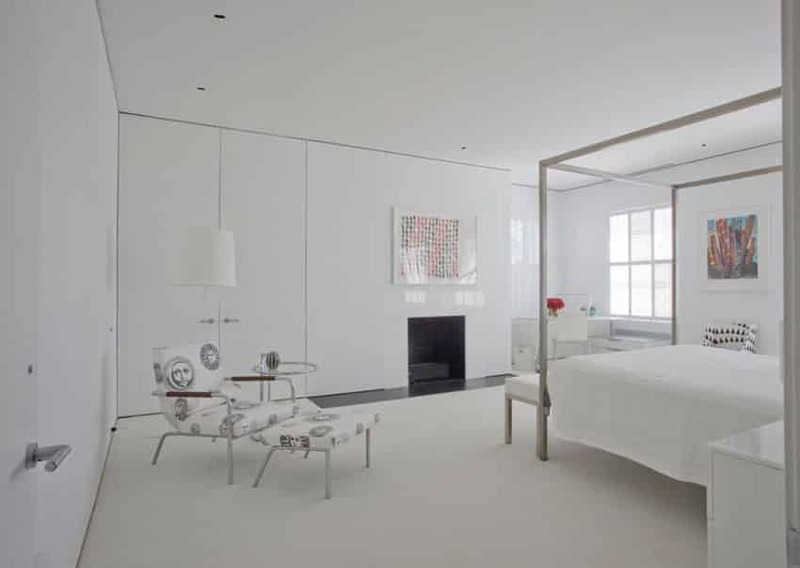 This is a great example of modern minimalist spaces, with its very clean and achromatic scheme. The white carpet flooring adds texture to the clean white space, while the use of very light wood tones adds a touch of subtle natural color to the space. Walls and ceiling are all in plain white with no ornamental elements of moldings. 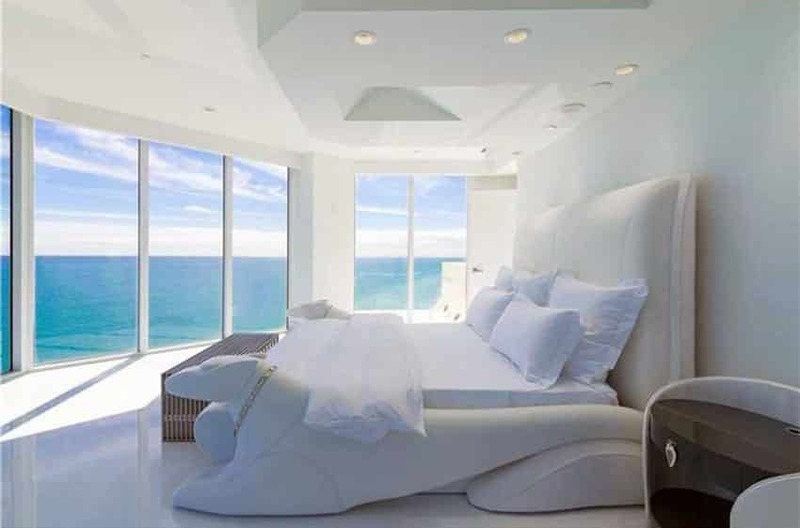 The bed is white as well, with white sheets and pillows, and the accent chair on the corner of the room is also white and made from molded plastic to create the unique curved form. What’s great about all-white color schemes is that you can easily add in any bold accent color to give it an updated, refreshing look. This transitional style bedroom is a great example of such. Taupe floors, white walls and white furniture pieces comprises of the bedroom, but is given a bold pop of color by using bold violet ikat-patterned duvet covers and accent pillows. The use of violet definitely adds more personality and brings your focus into the bed, making it the focal point of the room. This elegant empire style bedroom is a girl’s dream with its dainty sinuous curves and elegant draperies. The room has a unique polygonal shape, with lots of windows for light and ventilation, but uses elegant sheer curtains and peach-colored drapes for light control an privacy. Off-white carpet floors were used for warmth and comfort, while the metallic cream-colored wallpaper adds a nice texture to the walls. The wrought iron four-poster bed is definitely the star of this bedroom with all its sinuous curves creating a dainty canopy and is painted in a burnished gold color to soften the look of the metal. framing. To match, the bed and pillow covers add a touch of golds in it as well. 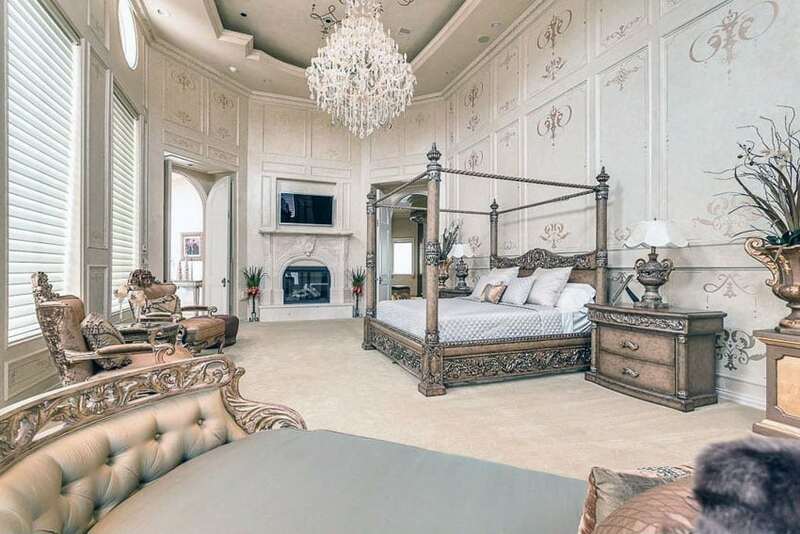 The result is a stunning bedroom fit for royalty. A modern minimalist bedroom which combines simple patterns and materials to achieve a clean and elegant look. Fruitwood floors sets a warm tone to the space,while the plain white walls and ceiling keeps that clean & crisp look. The bed is a low fully-upholstered bed in white, and uses a dark brown rug underneath it to frame it and give it more emphasis. Due to the minimalist style of the room, accessories are very minimal – in this room you will see a wall art, an accent chair, a white vase and a chandelier only to accessorize the space. Another empire style bedroom design which feels a little grander and more intimidating because of its high ceiling and heavily-carved motifs. Despite the heavy look of the furniture pieces, though, the white color scheme helps balance out these elements and create a more refreshing look for the classic space. Paneled walls are all in white with stenciled patterns in metallic gold to match with the other elements of the room. A large crystal chandelier hangs above the very high ceiling of the room, giving it a really grand and elegant appeal. Furniture pieces are either gilded and bronzed, with acanthus leaf motifs and other classic-themed motifs. They are matched with silver and gold fabrics, as well as tan leather for a more luxurious feel. For the bed, it uses simple silver-gray quilted sheets as the details on the bed are already quite busy. 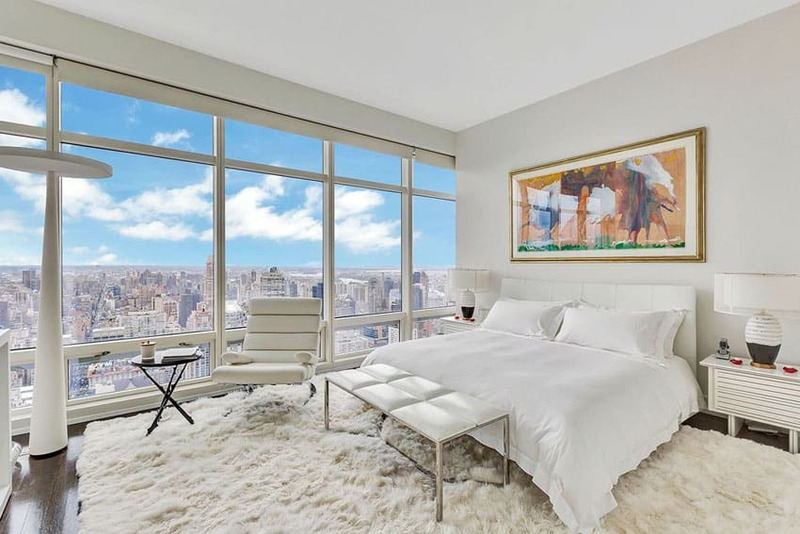 Large picture windows provide this bedroom a gorgeous panoramic view of the city and lots of natural light to go with it. The pleasing scenery makes a nice and colorful background, which makes the all white color scheme ideal for the space. Light maple floors, white walls & ceiling serves as the basic finishes of the room, while the furniture pieces used uses white fabric sheets and upholstery, combined with dark toffee wood finish for a bit of contrast. The small crystal chandelier and chaise lounge add a touch of glam to the space, while the quatrefoil cream area rug makes the room feel more cozy. 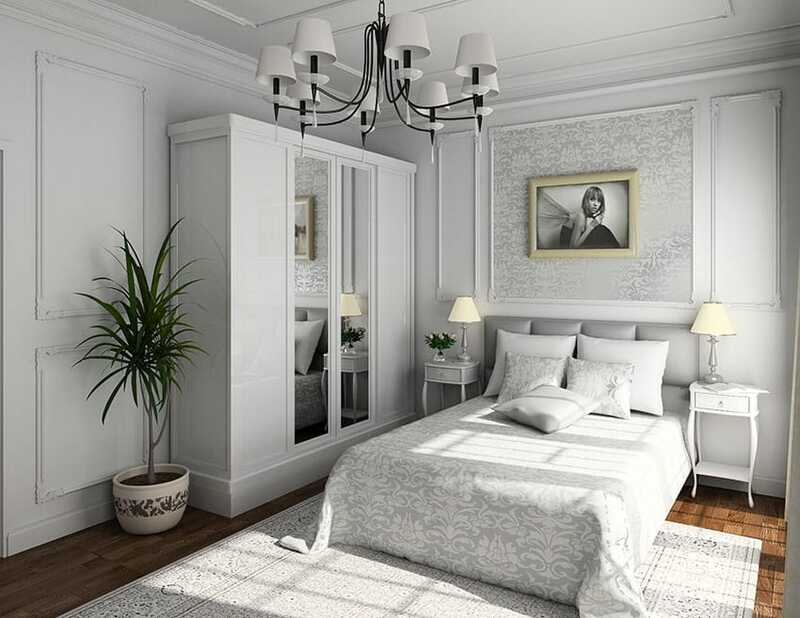 A gorgeous classic French style bedroom which combines classic elements and makes it look lighter and more modern by using a clean gray and white color scheme. This bedroom has dark Fruitwood flooring, which makes for a bold and dark background, so to balance it, the walls, ceiling and the moldings were all painted in white to make the room look brighter. The furniture pieces uses a combination of different finishes – gray for the nite tables, mahogany framing with white upholstery for the bed and silver for the side table. The gray traditional style area rugs also help frame the bedroom area, while the iron chandelier sets a cozy and mysterious mood to the space. Compact storage, like in this example, helps you achieve that coveted clean modern minimalist look by keeping clutter out of sight. 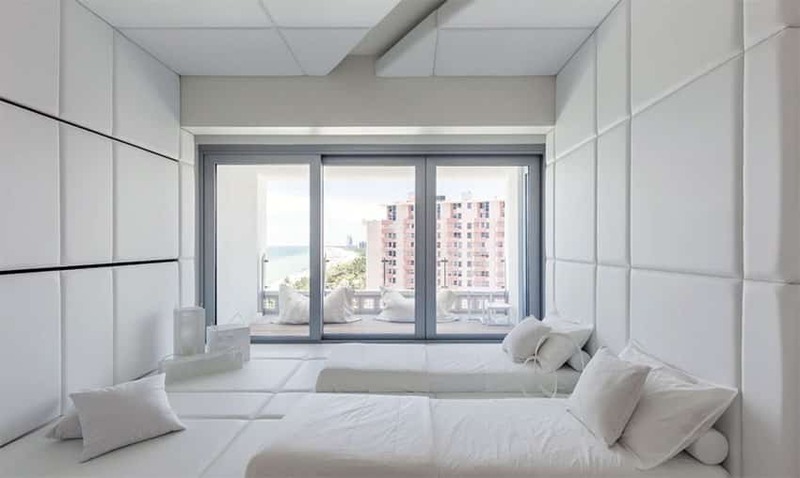 This all-white modern bedroom simply uses a combination of stainless steel furniture with white fabrics and finishes for a bright and clean modern look, and takes advantage of modular cabinets and shelving to help keep clutter away from the view, achieving a successful minimalist look for the space. Fun fabric patterns as well as wall arts on the other hand, add a little color and pattern to the space so that it doesn’t look too flat. 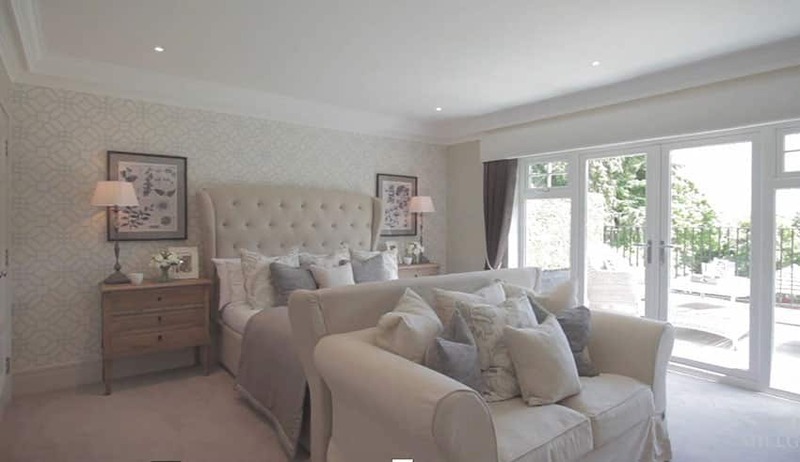 This bedroom is another great example of excellent use of storage in a modern style bedroom. You will see that along the hall area is the cabinet and storage area, wherein all items and other clutter are kept away from the view, creating a cleaner and more spacious looking room. Furniture pieces as well as walls and ceiling keeps to its modern look as they are simply finished in white. 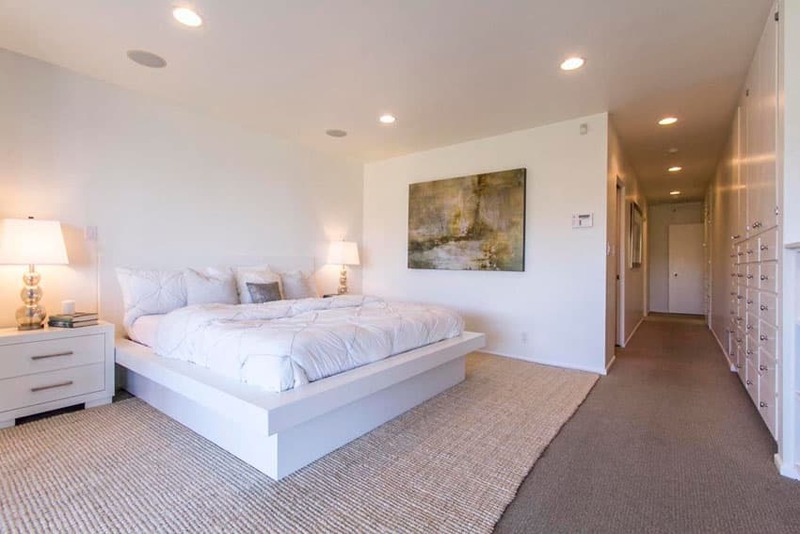 The beige carpet flooring and the jute area rug underneath the bed is what adds a little more warmth and texture to the space to help keep the room from looking too flat. 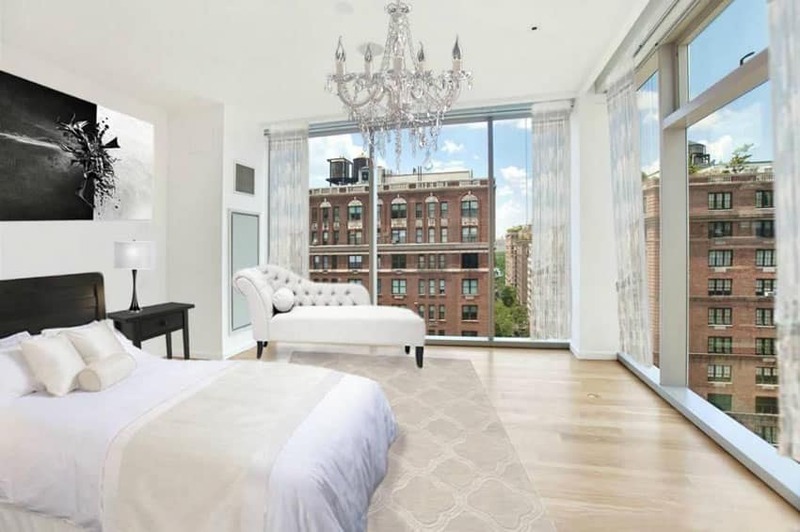 This gorgeous high-rise apartment bedroom features a fully padded accent wall which uses light taupe fabric to match the off-white upholstery of its queen-size bed. The combination of whites & cream/taupe colors gives this room a lovely warm tone, further emphasized with its use of warm colored lighting and bold cherry wood floors. Despite being very simple, this room is able to achieve a universally-appealing and timeless appeal. A transitional French style bedroom which features a refreshing mix of white and light cool-tone colors to create this lovely bedroom. Being a little short on space, it uses light-colored basic finishes like white walls and ceiling, combined with light walnut floors to make the room appear bigger. The twin size bed has a high upholstered headboard in light sage green for a fresh cool tone and matches it with white Egyptian cotton sheets. There are 2 white nite tables beside the bed, a jute area rug and a bright teal artwork on the wall which adds that needed pop of color and texture to the space, helping complete the look. For a refreshing summer feel, yellow is great choice for an accent color. This bedroom combines white with yellow and a touch of natural beige tones, creating a tropical summer feel to the room. Basic finishes include oak wood floors combined with white walls and ceiling, and light yellow doors and moldings. The dark floors transition into a lighter color with the use of natural jute rug which also adds texture and frames the entire bedroom. Loose furniture pieces are mostly white, with the exception of the wooden desk, and is accessorized with yellow pillows, flowers, and artwork. 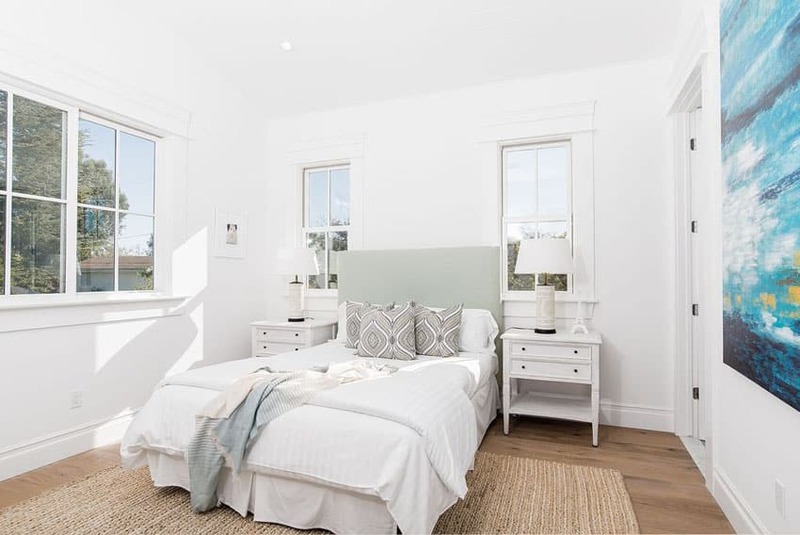 A lovely attic bedroom which really looks bright and clean as it has lots of windows, a high sloped ceiling and white basic finishes, making it look more spacious. Walls were painted in an warm off-white color, so the dark oak wood floors can slowly transition towards the flat white wood slats used on the ceiling. The fully upholstered tufted bed in steel blue adds a refreshing pop of color to the clean white space, but doesn’t go overboard because of its pale cool tone. Other wooden pieces were finished in a light gray color, giving it enough contrast against the white walls, adding more dimension to the space. 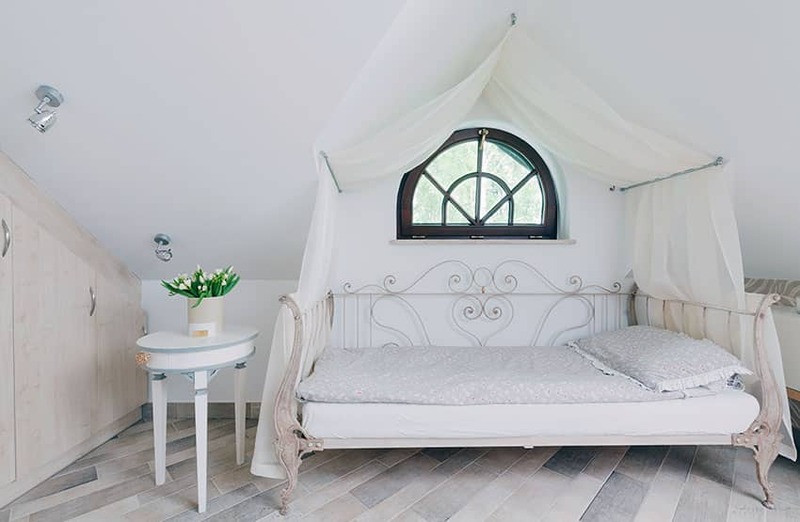 Another gorgeous attic bedroom design in which an all-white color scheme was used to make the room feel larger. There are windows on the sloped area of the wall to provide the room with sufficient natural light, and the inside of the room uses all white finishes for a very clean feel. The wooden furniture pieces are all in white, accessorized by frilly fabrics and pillowcases on the bed, some gold accessories and light yellow accent pillows. This bedroom has a stunning panoramic view of the sea which is enough to give this simple bedroom a bright pop of color. Because the view takes center-stage in this design, furniture pieces are in white, including the basic finishes of the floors, walls and ceiling. The use of all-white furniture pieces also allows flexibility in accessorizing, making it easy to accessorize with other colors, be it bright, dark or pale. This studio apartment bedroom has a Japanese-inspired design, which focuses on acoustics, minimalism and comfort. The bed area is actually a slightly raised platform with fully padded floors, walls and ceiling, using white leather fabric. The bed used doesn’t have a frame, but instead simply uses a futon-inspired flat mattress covered in white sheets placed on top of the padded platform, which in turn provides extra cushion to the mattress. This design also makes the room more compact and flexible, as you can easily store away the mattresses when you want to use the space for sitting, or you can add one or two more mattresses if you need more space for sleeping. This gorgeous transitional style bedroom features a wonderful combination of off-whites and charcoal gray.Charcoal gray could be a little intimidating to use, but with the right amount of grays vs whites, you will be able to achieve a bright and refreshing room with subtle amount of contrast like this example. Walls are cream toned off-white combined with light maple wood flooring, giving you a clean & bright background. The wooden poster bed uses ash gray finish, matching the upholstery of the armchair in the sitting area. Smaller accessories like accent pillows, area rugs and table lamps are also in gray, giving you a moderate amount of variety in the space. This is another example of a transitional style bedroom which uses white and gray color scheme for a more modern look. Unlike the other examples, this bedroom is a little smaller, so it uses smaller furniture pieces and less accessories as well. The walls of the room are painted in white and uses decorative moldings to create a faux paneled look, which also matches the design of the ceiling. The loose furniture pieces comprises of a bed with gray padded headboard, 2 side tables and a white cabinet with mirrors. This bedroom also uses bedsheets which matches the wallpaper used on the accent wall, for a more coordinated look. 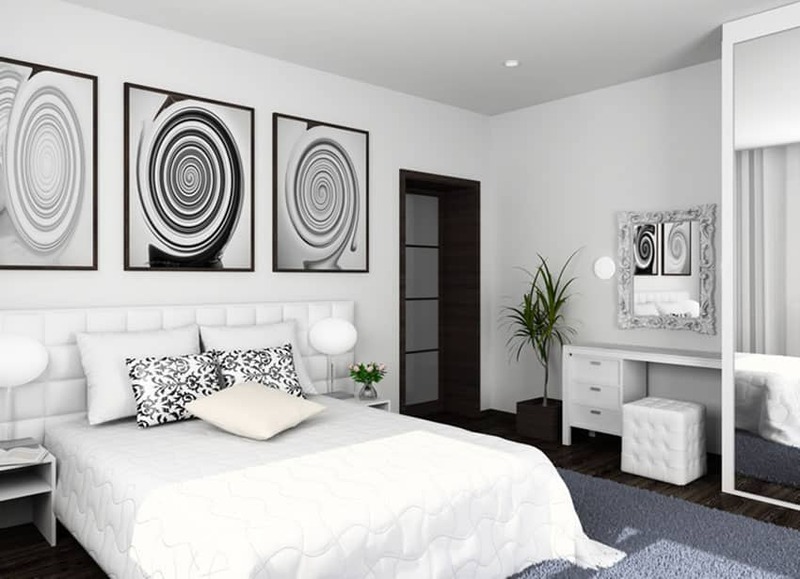 This modern minimalist bedroom has a black and white color scheme, but adds lots of variety in terms of patterns and textures, creating a more dynamic-looking design. Furniture pieces are all in white, some of which have unique textures like the padded headboard and the tufted ottoman. The bedroom also injects other patterns like the curved patterns on the quilt, the damask pillows and the psychedelic swirls on the wall art. This variety of designs help make the simple bedroom look more unique and interesting as well. This gorgeous transitional style bedroom Has a nice combination of cool and warm tones. Instead of going for a flat white color, it favors the use of a light taupe color for a warmer, more cozy feel. You will see the upholstered furniture pieces, floors and walls using this color. Accent colors include a pale slate blue and a pale green color which can be seen used on the accent pillows, as well as the wallpaper on the accent wall. These colors give a cool touch of color to the warm toned background, and creates a nice and refreshing balance of colors. The liberal use of lace and sheer fabrics give this small bedroom a very dainty and dreamy feel, further enhanced with its use of white fabrics and furniture pieces. The notable element of this bedroom, however, is its bright mint green vintage wallpaper which definitely grabs your attention and helps emphasize the bed area. This is a great idea for a small attic bedroom, in which basic finishes are kept minimal – white walls and ceiling and light maple wood finish. The clean and simple look helps make the room look more spacious, and allows you to use more intricate furniture pieces, such as the wood and metal daybed with sheer fabric canopy in this example.